A Fond ‘Farewell’ and a Challenge from the Bishop! Thank you to everyone who joined us at St Andrews Hall, Norwich on the 4th of October. 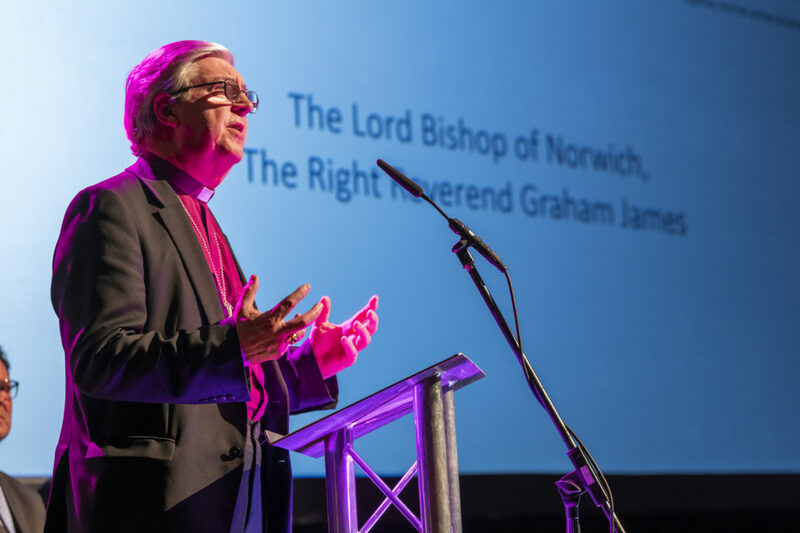 With a packed audience of over 300 guests it was the perfect opportunity to say ‘thank you’ and ‘farewell’ to our founder and ongoing supporter, the Lord Bishop of Norwich, the Right Reverend Graham James. Henry Cator, Chair of the Foundation, opened the proceedings, indicating how timely it was to celebrate the achievements and growth of NCF before Bishop Graham moves on to pastures new. He emphasised that the reception would not have been possible without the support of CCLA – one of the UK’s largest charity fund managers and a key partner to NCF – who had funded all of the event costs. 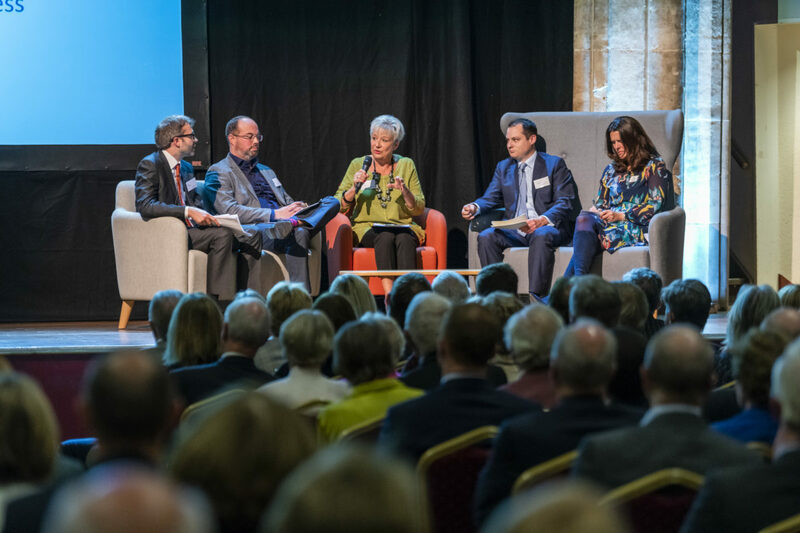 As Chief Executive of the Foundation, Claire Cullens took the audience on a journey back to 2005, when NCF was set up by the Bishop and the founding benefactors. Comparing and contrasting how the world looked and felt then, Claire stressed that Bishop Graham had been a reassuringly constant and supportive presence throughout the many years of challenge, and the scale of the Foundation’s ambition and success had been truly phenomenal. She then introduced a short film which showcased the Foundation’s many achievements over the past year and our investment of over £3 million into local communities. The audience was then treated to a TV-style studio interview fronted by BBC presenter and NCF Vice-Patron, Carol Bundock. Speaking to a panel of both funders and grant recipients, she invited them to tell their own stories about how they have worked in partnership with NCF to support those in need across Norfolk. Our keynote speaker at the event was David Sheepshanks, Chairman of our national body, UKCF, which represents the voice of community foundations across the country. He talked about the concept and importance of philanthropy and how all of us can be philanthropists by giving just a small bit of our ‘time and treasure’. But he also stressed that philanthropy must make a difference – impacting in a significant and lasting way to help improve people’s lives. Henry Cator led a tribute to Bishop Graham, highlighting that it was his clarity of vision, conviction and commitment which had forged the Foundation over a decade earlier. He said that the Bishop could rightly be called a ‘Visionary Philanthropist’ – someone who understands that real change requires a deep understanding of community needs, an ability to act, a requirement to take people with you, and some grit and determination in supporting those who need help. He concluded by saying that while everyone was sad to say ‘farewell’ to Bishop Graham, he felt sure that the Bishop himself would derive a lot of comfort from the fact that he leaves NCF in great shape – a trusted local charity with the leadership, knowledge and relationships to continue to deliver positive change. Bishop Graham reflected on the early years of NCF, when it was a small charity with lofty ambitions. He talked about the exponential growth of the organisation, in line with that ambition, and how the Foundation now sits as a major charity, bridging the gap between those in need and those who can help. 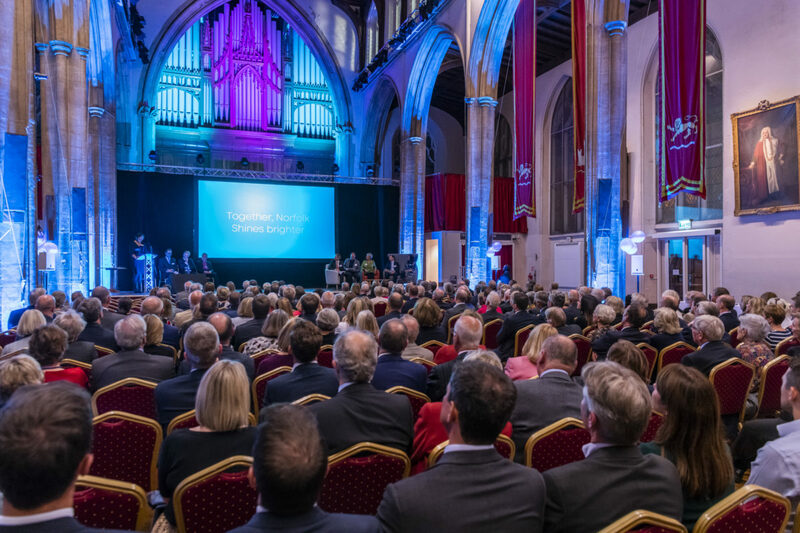 He saw the work of the Foundation as crucial in delivering a real difference on people’s doorsteps and stressed that while he will be moving on, the Foundation has been set up in perpetuity – it will always be here to make Norfolk a better place for everyone. He concluded by laying down a challenge. While the county has a population of 900,000, only 1,000 people have so far supported NCF with their time and money. He wanted philanthropy to be an everyday activity involving many more people and believed that we should look to add another 1,000 philanthropists to join us on the next stage of our journey. Check out our short film below which showcases our work over the last year. It was really good to hear all about NCF from the beginning, what an amazing visionary Bishop Graham is.